The drug contains a complex essential compound of testosterone, which is extremely positive effect on male libido and an increase in strength on the building of the muscular system. In addition, it has a large list of positive effects such as: increased immunity, energy flow, strengthening joints, bone and connective tissues. All these factors greatly reduce the risk of injury during high power loads. 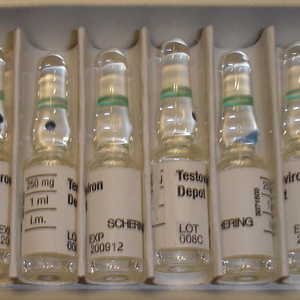 Testoviron Depot is eliminated from the body slowly enough and for this one injection per week will be quite enough. In this case, the dosage of the drug for experienced athletes should be from 500-1000 milligrams at a time. However, some people prefer to divide the drug intake twice a week and then the dosage of the drug will be 250-500 milligrams at a time. For beginners, the recommended dose is only 250-500 milligrams per week. Testovorin Depot-250 tends to aromatize, which entails the following side effects: gynecomastia, testicular atrophy, high blood pressure, and water retention. According to this should be taken in the course of anti-estrogen drugs.